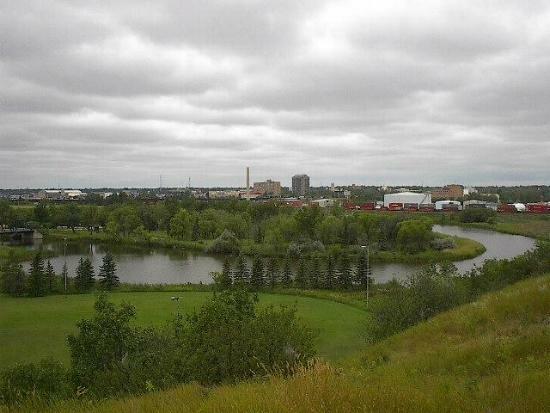 Located along the Moose Jaw River Valley in Moose Jaw, Saskatchewan Canada. Plaxton's Lake, complete with sun shelter and boardwalk. Lions River Park, picnic tables and barbecues. Kiwanis River Park, picnic tables, fire pit, and the outdoor Speed Skating Oval. Rotary River Park, the Burger Cabin, McCaig Gardens, playground, and sun shelter. Kinsmen Wellesley Park, playground, sun shelter, picnic tables and barbecues. Connor Park, barbecues, canoe lauch, firepit, picnic tables, pavillon, and playground. Other areas of Wakamow include the Reekie Uplands, located along the South Eastern lands above the valley (be sure to look for the Wakamow sheep); the Trans Canada Trail between the Reekie Uplands and Connor Park. Kingsway Ecological Zone, complete with a trail through four ecological zones. The Devonian Trail, a 4.2 km pedestrian and cycling asphalt pathway from near Union Hospital, through Plaxton's Lake, Lions River Park and Rotary River Park to Kinsmen Wellesley Park. The River Valley Campground located across the road from Kiwanis River Park provides seasonal camping and motorhome spots. Farming, some residential housing and even a private greenhouse also help create a unique and diverse valley setting. Unless otherwise noted all photographs were taken by Don of www.Wakamow.com and are the property of this website. Any commercial use requires permission.